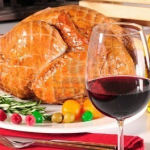 Thanksgiving Reds - Write for Wine: It's Wine O'Clock Somewhere!Write for Wine: It's Wine O'Clock Somewhere! Thanksgiving is only three days away, and we’re trying to decide what wines to pour. Do you know yet? Perhaps you’re looking for a good pairing for your turkey feast, or a special bottle to take to a family dinner or an evening with good friends. Some people prefer whites such as Sauvignon Blanc or Riesling; others would rather sip on reds. Some pair well with turkey or sides, and others are best at parties. There is no right or wrong! Here are some special-occasion red wines that we recently tasted and consider the Top 10 for our Thanksgiving festivities. They were crafted in Washington state, Oregon, California, British Columbia and New Zealand, with prices ranging from $30-$60. Happy Thanksgiving! And many thanks for reading this blog over the last ten years. This entry was posted in British Columbia, California, New Zealand, Oregon, Walla Walla, Washington, Wine and tagged Bordeaux blend, Cabernet Sauvignon, Craggy Range, estate wine, Giant Head Estate Winery, Mercer Estates, Meritage, Noble Ridge, Old Vines Foch, Panther Creek, Pinot Noir, Quail's Gate, Result of a Crush, Saviah Cellars, Syrah, Toil Oregon, Walla Walla, Washington wine, Washington wineries, wine, wineries by Margot. Bookmark the permalink.